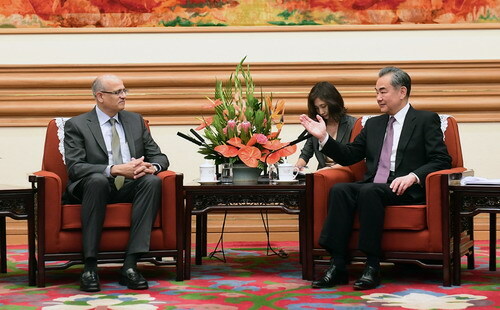 On April 22, 2019, State Councilor and Foreign Minister Wang Yi met with Foreign Secretary Vijay Keshav Gokhale of India in Beijing. Wang Yi said that as neighboring major countries, representatives of emerging economies and strategic cooperative partners, China and India should continue to strengthen strategic communication, enhance political mutual trust, and maintain close coordination in international and regional affairs. Over the past year since President Xi Jinping held a meeting with Prime Minister Narendra Modi in Wuhan, our two countries have made great progress in bilateral relations and comprehensively promoted cooperation at all levels in various fields. Our shared interests far outweigh differences. Being faced with major global changes unprecedented in the past century, China and India should strengthen solidarity, keep the positive momentum of sound and steady bilateral relations, and uphold the common interests of emerging economies and developing countries. 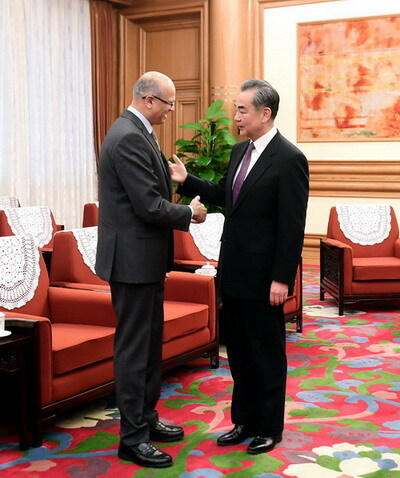 Vijay Keshav Gokhale said that since the meeting between leaders of the two countries in Wuhan, the two sides have had active political interactions, advanced practical cooperation and successfully held the first meeting of the India-China high level people-to-people exchanges mechanism. The Indian side is willing to maintain high-level exchanges with the Chinese side, enhance mutual understanding, accommodate each other's concerns, and promote greater development of India-China relations.